Complete Natural Nutrition is introducing healthy pet treats that both you and your dog can feel good about! In 2005, Complete Natural Nutrition set out to develop products that would make a significant difference in the daily lives of dogs and cats. We understood that pet parents did not need another treat, cookie, rawhide or body part to feed their companion pet. Rather, we set out to provide frustrated pet parents with treat solutions for their beloved pets; pets with specific health issues like diabetes, overweight, finicky, allergies or on restricted diets. We set out to provide discriminating pet parents, who read labels and who want US made, US sourced ingredients with the world's healthiest treats. Complete Natural Nutrition is first and foremost a nutrition company with its own board certified animal nutritionist. Each ingredient is handpicked for nutritional integrity and its short and long term health consequences. Our ingredient statements are short with few ingredients and we follow a strict philosophy that 'less is more' - 'simple is better', just like Mother Nature intended. We believe that dogs and cats are eating way too much processed food, too much sugar, too much salt and too much refined carbohydrates - all things you will never find at Complete Natural Nutrition. Terräbone is the world’s healthiest and safest edible dental chew bone. The #1 ingredient in a Terrabone is USDA certified organic brown rice. Unlike other edible chew bones, Terräbone contains no animal by-products like gelatin or animal glycerin. Terräbone contains no added salt, no added sugar, no chemical preservatives, no artificial colors or flavors and ABSOLUTELY NO WHEAT, NO GLUTEN, NO CORN & NO SOY. Terräbone is also very low in fat with zero saturated fat and zero trans-fat. With full knowledge and clarity of what’s in a Terräbone, pet parents can be confident that their dogs are enjoying a bone that is safe from indigestible ingredients (have you ever seen ‘green’ poop?) and an alternative to rendered body-parts. Terräbone is in a class of it own for dogs who deserve the very best. What Makes Terräbone So Unique? Terräbone is the first edible chew treat in the world that is 100% natural and made with 50% organic ingredients. Each ingredient in Terräbone is carefully selected to ensure safety, enjoyment and digestibility with no compromises to your dog’s health. Real Food Toppers Pure Chicken Breast-We exclusively use beautiful white meat chicken that is hormone free, antibiotic free and sourced in the USA; inspected and approved for human consumption. Real Food Toppers Pure Wild Salmon-Pure Wild Salmon, caught in the Pacific, is a super food full of wonderful raw protein and fantastic natural nutrition. Real Food Toppers Pure Beef Sirloin-Dogs and cats are meat eaters which makes it difficult for them to resist morsels of 100% Pure Beef Sirloin. These morsels of steak are the finest human grade cuts; your pet deserves nothing less. Real Food Toppers Pure Beef Liver-Liver treats for pets have been around for a long time, but the source of the liver used has always been questionable. We use human grade beef liver. What Are The Ingredients In Real Food Toppers? We exclusively use premium grade human cuts of US sourced meat. There is NO wheat, corn, grains, sugar, fillers, chemicals or by-products. RFT has no refined carbohydrates, no added salt – just pure digestible quality protein. Dogs love cheese and Cheese Please is the healthiest and most wholesome way for them to enjoy pure cheese. It starts with real Wisconsin cheese that is produced with low salt and 99% lactose free and then crumbled and baked. Nothing else is added making it healthier than supermarket cheese. The result is mini crunchy-nuggets full of 100% natural goodness with only 3 calories per nugget. Cheese Please is an ideal treat for training or spoiling. And because Cheese Please can be easily crumbled, the smallest of dog breeds can enjoy the awesome taste of real cheese. For finicky pets that needs enticement during meal time, Cheese Please can be crumbled and mixed into kibble to create a dining delight. With no grains, no wheat, no corn and no soy, dogs with allergies can still enjoy Cheese Please. What Is The Difference Between Cheese Please And Human Cheese? Nothing! There is no difference except Cheese Please is baked, 99% lactose free, low salt, does not need refrigeration and has a 2 year shelf life, and you can put it in your pocket and take it to the park (you don’t want to do that with regular cheese!). There is absolutely no junk, no preservatives and no artificial ingredients in each wholesome nugget of Cheese Please – just pure cheese. What Do Customer’s Say About Our Products? I have never fed my dog rawhide or animal body parts. Terrabone is the first real choice in an edible chew that doesn’t scare me. Congratulations for using organic and 100% natural ingredients that my dog loves and I feel completely comfortable to feed. My dog and I thank you for creating the most amazing cheese treats in the world. We both can’t get enough of your Cheese Please. They are so delicious. Our cats DEMAND their Real Food Toppers Pure Chicken Breast & Wild Salmon. Your product has been a godsend to our cats and us. It’s sometimes the only thing they will eat. Order Your Complete Natural Nutrition Products Today! Complete Natural Nutrition has created pet treats that are not only delicious, but are nutritionally sound. 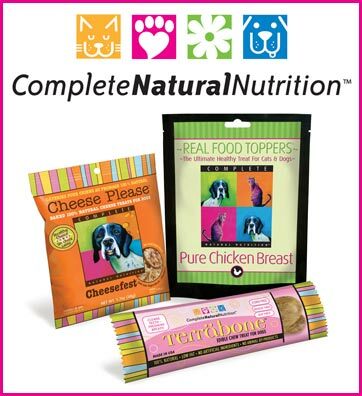 If you’re tired of feeding your pet sub par animal treats that contain more fillers then actual nutrition, you need to order from Complete Natural Nutrition. So what are you waiting for? Order Today!